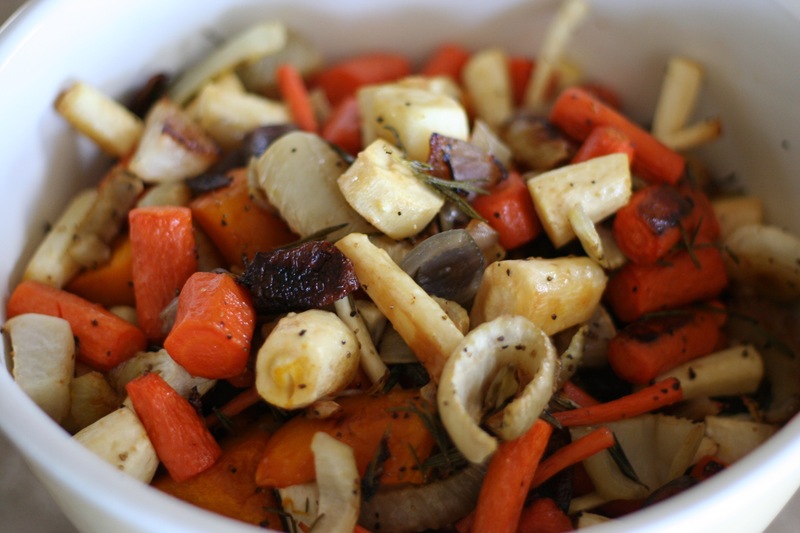 Roasted root vegetables are so simple to prepare. They add a deep, earthy heartiness to a meal. The vegetables above graced our Thanksgiving table. I recommend them as a satisfying side for roasted meats, such as turkey, ham, or beef. Our vegetarians guests found them filling and comforting, too. There is no one recipe for roasted root vegetables. The combinations are limited only to what is available to you and your personal taste. This Thanksgiving I used carrots, parsnips, turnips, onions, sweet potatoes, Kabocha squash, and fennel. Squash isn’t a root vegetable, but it is similarly a storage organ for carbohydrates and therefore roasts well alongside the root vegetables. And yes, fennel is an above-ground bulb. But it, too, cooks up beautifully when roasted and it adds another dimension of sweet flavor to the mix that I find intriguing. Other suggestions include garlic, shallots, leeks, rutabaga, celery root, beets, radishes, and potatoes. Plan 2/3 to 1 pound of raw vegetables per person. Leftovers reheat well. 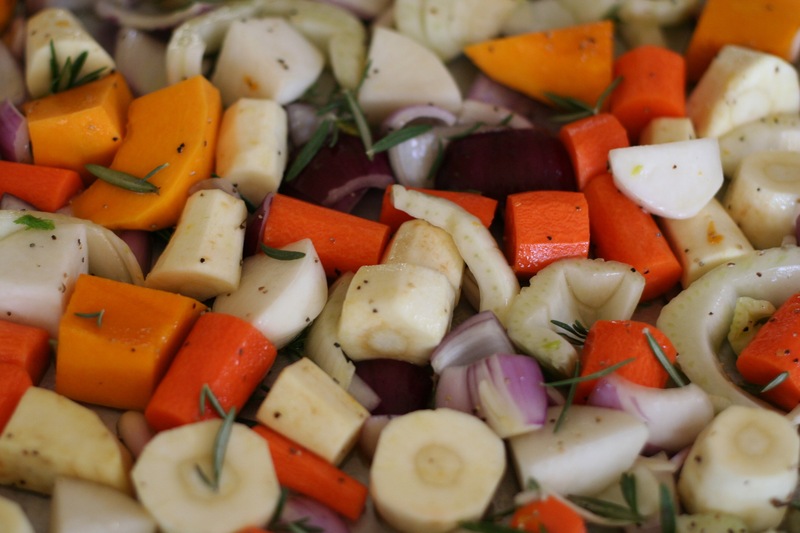 Roasted vegetables also make a great addition to soup or a tasty addition to an omelette. Preheat your oven to 400. Peel the carrots, parsnips, turnips, squash, sweet potato, and onions. Cut them into 1″ pieces. Slice the fennel horizontally into 1/3″ slices. Place all of the vegetables into a large bowl. Sprinkle with olive oil and salt and pepper. Toss well to coat the vegetables. Remove the rosemary leaves from the stalks. Toss the rosemary with the vegetables. Spread the mix out in a single layer on a baking sheet. Bake 45 minutes to one hour. The vegetables should be soft all the way through when pierced with a knife. The vegetables can be done ahead and reheated in a low oven just before serving. This entry was posted in Cooking Basics, Sides, Vegetarian and tagged cooking basics, quick entertaining, root vegetables, vegetarian. Bookmark the permalink.